In the best (worst?) tradition of see something and want it now a post from Sally BR at the Bewitching Kitchen hit my inbox last night. Some not so sublimal message went straight to my brain…..
‘Oh yes!’ , I thought, ‘Blueberry muffins, I want them and I want them now!’ – (after a virtuous light supper of broadbeans and tomato passata on pasta). Thank you Sally! Sometimes reading my friends’ blogs is just what I need to prompt getting out the mixing bowl! I went outside and inspected my very small blueberry plant, there were exactly 6 ripe blueberries on it. Not quite enough for a batch of these, in fact, let’s be honest, I have never grown more than a handful of these and the dogs have a habit of hoovering them off the plant anyway when they think I’m not looking. and I made them very fast. I sieved the dry ingredients together. Beat the eggs, yoghurt, and soya milk together gently. Didn’t have buttermilk or much yoghurt left so added soya milk which seemed to work fine. Melted the butter in another pan. Then mixed the dry ingredients with the eggy/milk/yoghurt mix, drizzled the cooling butter in on top, gave that a quick stir, till the butter was just mixed in, folded the blueberries in. Plopped it into 11 muffin cases. I’ve realised that if you use one less muffin case, you get bigger muffins and they look more convincing. Baked them at 160 C on Fan setting for 25 minutes. Eaten approx 15 minutes after they came out of the oven. 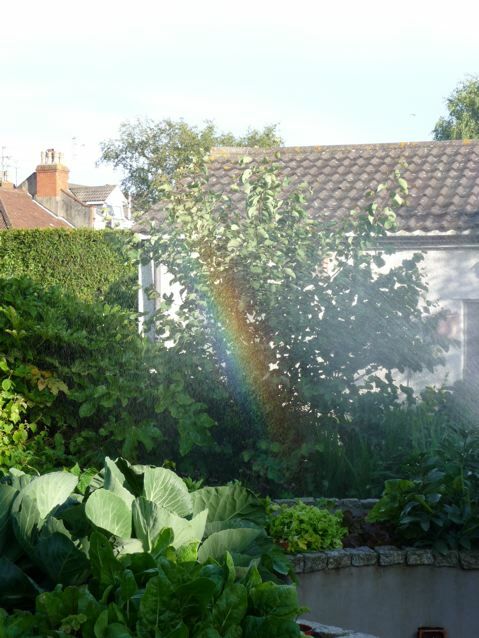 Watered the veg bed, admired the rainbow, went to bed. 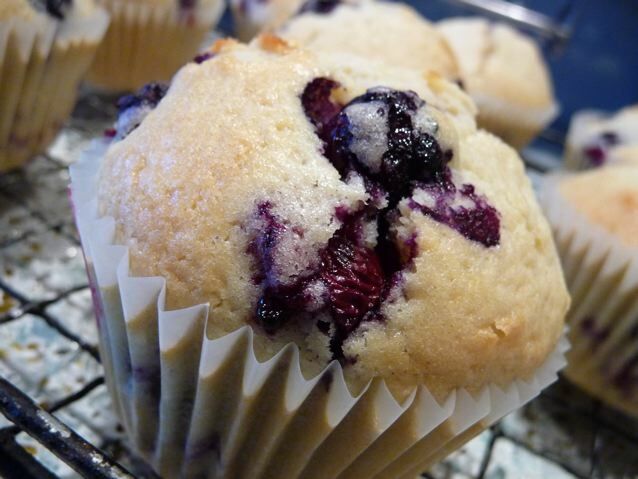 This entry was posted in Buns, Cakes, Garden, Recipes and tagged bewitching kitchen, blueberry muffin on 04/07/2010 by Joanna. They look great, muffins are so easy to mix and make so thanks for reminding me that I’ve not done them in a while! Beautiful blueberries and an even more beautiful rainbow! Your veg patch is growing like crazy! Blueberries and cherries- its all good in your kitchen. Congratulations on your certificate too- kit kats always taste better in the rain. Thank you Brydie. Yesterday I felt really 8) so had to brag a bit, the bit I didn’t say was that the 11 year olds of course did Long Swims of a mile! Maybe next year I will join them. Got to get a bit fitter though! That is just SO NAUGHTY posting that GREAT BIG PICTURE of that GREAT BIG MUFFIN as I know feel that my life depends upon EATING A HUGE BLUEBERRY MUFFIN WITHIN THE NEXT FIVE SECONDS. Arghhhhh !!!! The chain reaction to muffins is happening, Joanna. I’ve just made my first ever batch – 11 of them as I ran out of mix scrapings for a full 12th one. Yours look delicious in blueberry colours. Plopped it into 11 muffin cases. I’ve realised that if you use one less muffin case, you get bigger muffins and they look more convincing.